It’s a truism to state that there’s little glamour in flying. All those transatlantic flights, lodged in the back of the plane with a screaming toddler and a broken TV screen. Or the low-cost landlocked journeys east, as far as you can go and still be in Europe, knees in your face, costs a fortune for a coffee. 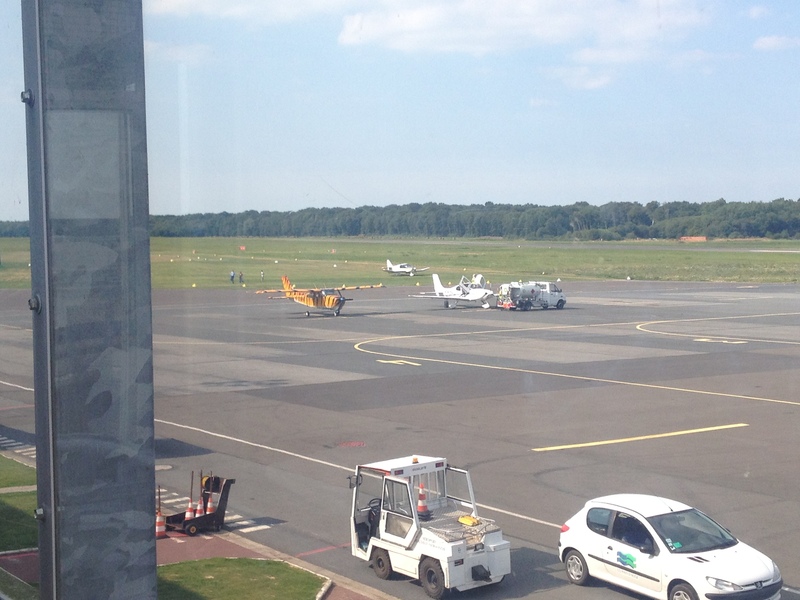 So what a joy to start a flight from Deauville Airport! It’s a two-gate terminal with a couple of weekly flights to City Airport, London, and charter flights during holiday seasons. There’s a flying school, and many private planes coming in and out. In the parking lot (a mere few metres from the airport terminal) a child of around 7 announces “My Dad has his own private plane.” Most people here do, I think. There’s a smart bar upstairs, and a restaurant with crisp white tablecloths and 3-course meals. No rushing for ferries and trains, or driving hours south from the ports. 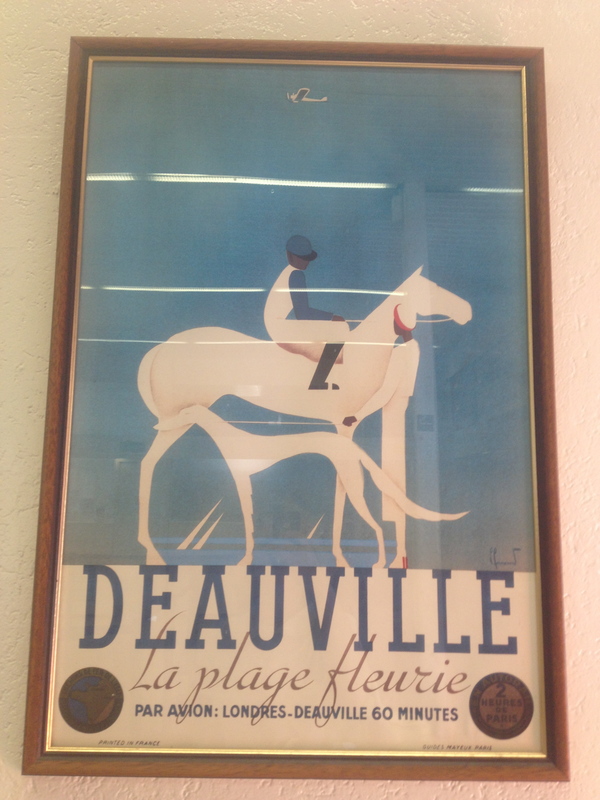 What better way to pop into your holiday home in Deauville or Honfleur? The CityJet plane is luxurious: leather seats and good leg room. Drinks are free, staff are courteous. There is fresh coffee and a Leonidas chocolate before landing. 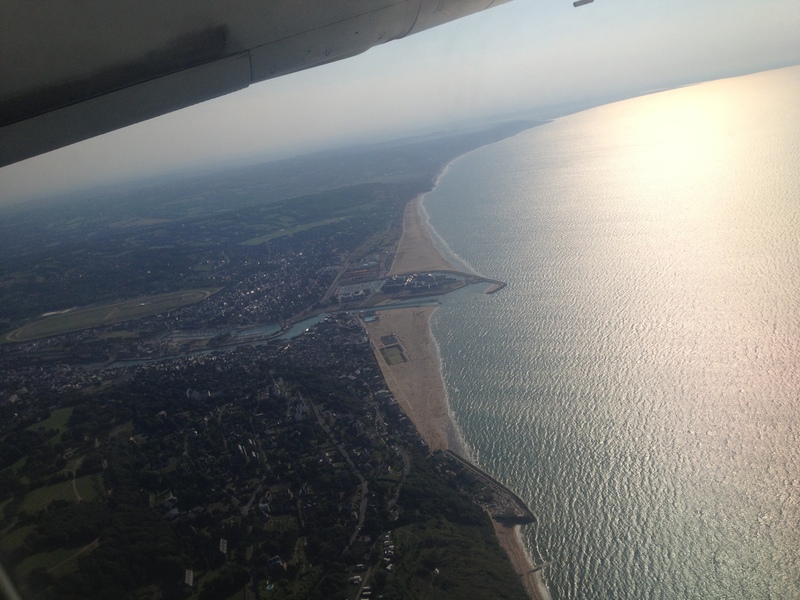 The plane stays low on a cloudless day and offers excellent views of Deauville with its sandy beach, marina, casino and racecourse. Later, there’s a birds eye view of London from Battersea Power Station over Parliament and along to the Olympic Park with its gleaming arenas. “A Peter Pan view” comments the briefcase-wielding gentleman in front of me who the staff know by name, perhaps he has something to do with the races or the film festival. Anyway, he’s right: if this were a Disney ride, you’d get back in the queue for another go. How’s that for a great flight. Thank you for a fabulous weekend and I’m glad your journey back was so glam! Ours was a bit fraught – the bank holiday queues through le Shuttle’s passport control meant we missed our crossing and the one after that… but we did set off with only 2 hours to go, so hardly surprising. I hope the girls enjoyed pony camp: it was an impressive set-up!